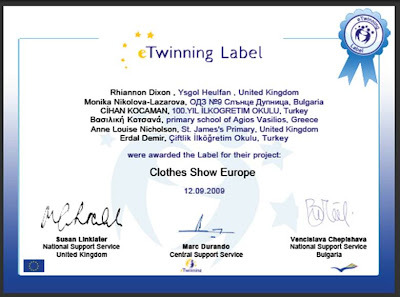 Primary 1 have just been awarded an e-twinning label for their new International project called "Clothes Show Europe". They will be working with young pupils from Bulgaria, Turkey, Wales and Greece. They are excited about their new project which will run until Christmas time. Keep checking our blog next term to follow our progress.